Killing Fields Memorial Stupa containing skulls of victims of the Khmer Rouge. THREE AND A half decades after the genocidal rule of Cambodia’s Khmer Rouge ended, a UN-backed war crimes tribunal has found two of the regime leaders guilty. Khieu Samphan, the regime’s 83-year-old former president, and Nuon Chea, its 88-year-old chief ideologue, have been sentenced to life in prison for their role in the 1970s terror. Both men, in dire health, denied any wrongdoing. They are the first of the regimes leaders to have been held accountable for the atrocities. The case, covering the forced exodus of millions of people from Cambodia’s towns and cities and a mass killing, is just part of the Cambodian story. Nearly a quarter of the population died under their rule, through a combination starvation, medical neglect, overwork and execution when the group held power in 1975-79. Khieu Samphan and Nuon Chea were both been charged with crimes against humanity, genocide, religious persecution, homicide and torture. Both men are in frail health and have required occasional hospitalisation during the trial. Khieu Samphan acknowledged that mass killings took place. But testifying before the court in 2011, he claimed he was just a figurehead who had no real authority. He denied ordering any executions himself, calling the allegations a “fairy tale.” Instead, he blamed Pol Pot, the group’s top leader, who died in 1998, for its extreme policies. Khieu Samphan also said he believed when he was young, that communism — which Khmer Rouge cadres took to the extreme, virtually enslaving the entire population in a bid to create an agrarian utopia — had given him hope when he was young, and the movement had opposed a pro-Western regime and neighboring Vietnam, Cambodia’s traditional enemy. Nuon Chea, who is known as Brother No. 2 for being Pol Pot’s trusted deputy, has appeared less repentant. At the start of the trial, in 2011, he blamed Vietnamese forces for killing Cambodians. Many criticised the slow justice and its cost. The tribunal, formally known as the Extraordinary Chambers in the Courts of Cambodia and comprising of Cambodian and international jurists, began operations in 2006. It has since spent more than $200 million, yet it has only convicted one defendant — prison director Kaing Guek Eav, who was sentenced to life imprisonment in 2011. Both defendants face a second trial that is due to start by year’s end, this time on charges of genocide. That trial is expected to take years to complete. Suon Mom, 75-year-old woman whose husband and four children starved to death during the Khmer era, said she was keen to see justice finally served, even if it is generations late. Some say the money that financed the trial should have been spent on helping survivors instead, or on the impoverished country’s infrastructure. Chea Chhunleng, a 23-year-old business student, said he was not opposed to harsh sentences for the two leaders, but said the trial could not change the past. It “can only provide justice … only the word justice. That is all,” he said. 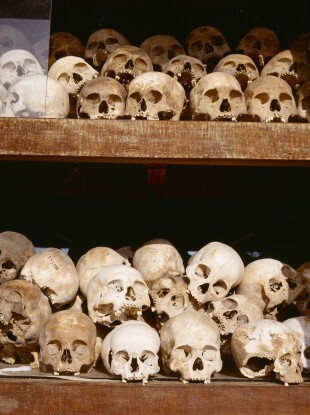 Email “Khmer Rouge leaders found guilty of crimes against humanity”. Feedback on “Khmer Rouge leaders found guilty of crimes against humanity”.